Call Your Senators and Tell Them to Hold Big Oil Accountable. Some Big Oil friends in Congress are trying to claim that the oil industry can't afford common sense safeguards to protect our health, our shores, and our economy from future catastrophes like the BP oil disaster. Well, guess what. Big Oil CAN afford it. The quarterly profit reports released by the oil industry this week show huge gains for Big Oil companies. Call your senators today and tell them it's time to start holding Big Oil accountable -- they can afford it. Thanks to Sierra Club supporters like you, we've sent nearly 50,000 messages to the Senate calling for action on the Oil Spill Commission's recommendations to restore the Gulf coast and prevent future disasters. Now we must show the Senate that there is no excuse to let Big Oil off the hook. We cannot allow Big Oil to continue lining their pockets while operating without common sense regulations. It's time to end our dirty, dangerous, and deadly addiction to oil, and the first step is holding Big Oil accountable -- call your senators today. "Exxon Mobil profits increase 53%," Dominic Rushe, The Guardian: January 13, 2011. "2nd UPDATE:Chevron Profit Soars, But Reserves Booking Disappoints," The Wall Street Journal: January 28, 2011. "BP resumes dividend payments as 4Q profits jump 33%," Deborah Hyde, Citywire: February 1, 2011. 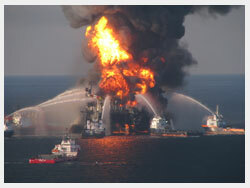 "Study Finds Oil Dispersants Lingered Deep Under Gulf," Renee Schoof, McClatchy: January 26, 2011. "Keystone XL may mean higher Canadian crude prices," Maria Sudekum Fisher, Bloomberg: January 25, 2011. "Kalamazoo River/Oil Spill Update," Health and Community Services Press Release: October 14, 2010.